Profiles International helps you take your employee recruitment and staffing program to the next level. Profiles International takes the guesswork out of recruitment by helping you identify the right people with the right mix of skills, abilities, interests, and job match before you hire them. 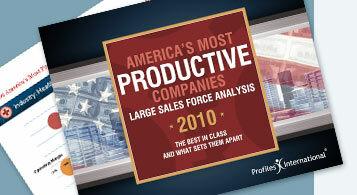 Hire the best sales force. A recent study showed that the correlation between the ability to deliver well in a job interview and the ability to do well on the job is just 14 percent, or one good employee out of every seven people you hire. If that 26 percent, or roughly one out of four, is still not a big enough percentage for you, consider traditional assessment tools used in the hiring process. These assessments measure personality characteristics. Personality tests raised the rate of success in hiring to 38 percent. When applicants were tested for both abilities and personality, employers found they were hiring the right people just over half or about 54 percent of the time. To take it one step further, the study considered interest assessments, an even more sophisticated tool. This raised the successful hiring rate to 66 percent. The study found that the most impressive and successful assessments are integrated measures of a combination of factors, and also include the concept of job match. They use cutting-edge technology combined with empirical data to evaluate the candidate against employees who are exemplary in performing their duties. These recruitment assessments increased an employer's ability to identify excellent candidates more than 75 percent of the time. Only Profiles International offers a full suite of employee recruitment assessments to help you discover a candidate’s actual match to the job. By matching candidates with jobs, you will increase your success rate and reduce turnover.